Enjoy the finest in Chesapeake Bay Fishing Charters on Maryland's Eastern Shore at Hoopers Island! Just 40 minutes south of Cambridge, MD, with easy access from Baltimore, Washington, DC, Annapolis, Ocean City, Pennsylvania, Virginia, and Delaware! Fishing the Chesapeake Bay in the areas of Hoopers Island, Taylors Island, Poplar Island, and Kent Island! We go where the fish are! 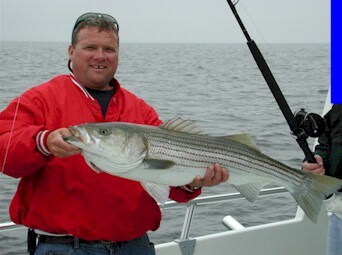 Chesapeake Bay fishing charters in Maryland for Chesapeake Bay Striped Bass, also known as Maryland rockfish or stripers, bluefish, croakers, Spanish mackerel, and other species. Come to Hoopers Island for the best Chesapeake Bay fishing action that Maryland's Eastern Shore has to offer! We also offer Chesapeake Bay lighthouse cruises, sunset cruises, and much more. For fishing charter booking information, please click here. Don't have your own group? E-mail us your name and phone number to join our make-up charter list! In addition to some of the finest in Chesapeake Bay fishing charters that Maryland has to offer, we also offer Chesapeake Bay Lighthouse Tours, Chesapeake Sunset Cruises and other Chesapeake Bay tours, Chesapeake Bay floating crab feasts, and cruises to various destinations along the Chesapeake Bay. We were recently featured in the Dorchester Banner! It was a great piece written about us and the services that we provide. You can read it here! We are located on Hoopers Island, just 40 minutes south of Cambridge, Maryland. ABOUT US BOOKING INFO. & DIRECTIONS LODGING SPONSORS & LINKS CHESAPEAKE BAY FISHING APPAREL CHESAPEAKE BAY FISHING RECIPES CONTACT US SEE US ON FACEBOOK! CHECK OUT CAPT. DAVE'S CHESAPEAKE BAY FISHING BLOG! We offer full and half-day Chesapeake Bay fishing charters off of Maryland's Eastern Shore, fishing for Chesapeake Bay rockfish (stripers or Maryland striped bass), bluefish, croakers, Spanish mackerel, and other species. We also offer Chesapeake Bay lighthouse cruises, sunset cruises and other Chesapeake Bay tours, floating crab feasts, and cruises to various destinations along the Chesapeake Bay. We are located on Hoopers Island, about 40 minutes south of Cambridge, Maryland. Regardless of the size of your group, or the uniqueness of your occasion, there is nothing that we can't handle! Come join us for a memorable experience on the Chesapeake Bay! 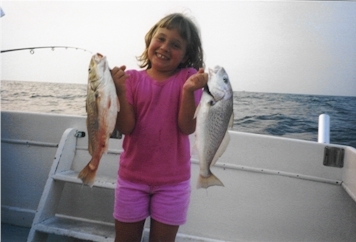 We offer Chesapeake Bay fishing options to accommodate a wide variety of tastes, from those who like to troll for those BIG Maryland rockfish, to those who would rather sit back and bottom fish for croakers. To keep up with all of the latest and greatest, check out our Chesapeake Bay Fishing Reports and Maryland Fishing Information page! If you like to troll for those BIG Maryland Striped Bass, April and May is the perfect time of the year for you! This time of year, these Chesapeake Bay rockfish are typically 28" and longer, and can weigh up to 50 pounds! Everyone on the boat is allowed one fish. For 2018, the fish must be 35" in length or more per Maryland regulations. So, you don't like to troll, huh? While we may do some trolling in late May and early June, we usually go into light tackle fishing action on the Chesapeake Bay during the summer months, using spinning reels, live bait, chumming, and bottom fishing! We catch more Chesapeake Bay rockfish, also referred to as summer stripers (must be at least 19" long, two per person, only one per person can be over 28" in length), bluefish, and croakers! During these months, we're still using light tackle, spinning gear for the summer Chesapeake Bay stripers, bluefish, and Spanish mackerel! In November and December, it's back to trolling for those Maryland rockfish on the Chesapeake Bay! 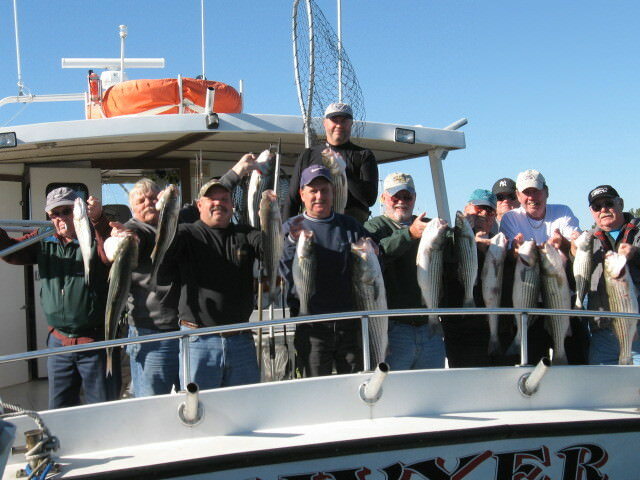 Put Captain Dave and his 30+ years of Chesapeake Bay Fishing experience to work for you! Perhaps, fishing isn't your thing and you'd rather go on a cruise! We offer a number of options from crab feast dinner cruises to trips to Solomons Island or Smith Island! We also offer number of tour packages for bus groups as well! For more information, check out the Chesapeake Bay Tours section of our website! 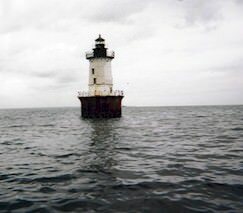 Perhaps, you'd like to check out some lighthouses on the Chesapeake Bay! Right now, we have Chesapeake Bay lighthouse cruises scheduled for August 10, September 19, 20, and 23, 2019! We may schedule more as the year progresses! To sign up, give us a call! If you have a private group and would like to do your own cruise, just give us a call! More information can be found in the Chesapeake Bay Lighthouse Cruises section of our website! Do you have a smaller group and are looking for an economical way to enjoy the beauty of the Chesapeake Bay? Join us for a Chesapeake Bay sunset cruise. Take in the beautiful scenery of the bay and a majestic Chesapeake Bay sunset! Learn more here! A Majestic Chesapeake Bay Sunset! We offer full and half-day Maryland fishing charters off of Maryland's Eastern Shore, fishing for Maryland rockfish (stripers or Chesapeake Bay striped bass), bluefish, croakers, Spanish mackerel, and other species. We also offer Chesapeake Bay lighthouse cruises, sunset cruises and other Chesapeake Bay tours, floating crab feasts, and cruises to various destinations along the Chesapeake Bay. We are located on Hoopers Island, about 40 minutes south of Cambridge, Maryland. Regardless of the size of your group, or the uniqueness of your occasion, there is nothing that we can't handle! Come join us for a memorable Maryland charter fishing experience on the Chesapeake Bay! THE "SAWYER" is a 52ft. x 17ft. 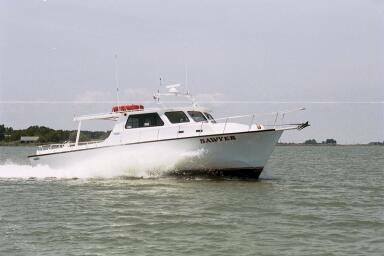 CHESAPEAKE BUILT VESSEL THAT CAN ACCOMMODATE GROUPS BOTH LARGE AND SMALL FOR SOME OF THE BEST FISHING ACTION ON THE CHESAPEAKE BAY, ALONG WITH TOURS AND CRUISES TO VARIOUS DESTINATIONS ALONG THE BAY! OUR BOAT IS COAST GUARD-CERTIFIED FOR UP TO 41 PASSENGERS AND EQUIPPED WITH A SPACIOUS CABIN AND A PAIR OF 450-HORSEPOWER CATERPILLAR DIESEL ENGINES TO GET YOU AROUND THE BAY IN A SAFE AND TIMELY MANNER! IN ADDITION, WE ALSO SPORT A COAST GUARD AWARD-WINNING SAFETY RECORD! FOR MORE ABOUT OUR BOAT, PLEASE CLICK HERE! Come join us for a memorable Chesapeake Bay fishing experience!! Be sure to contact us for this feature! We offer full and half-day Chesapeake Bay fishing charters off of Maryland's Eastern Shore, fishing for Chesapeake Bay rockfish (stripers or Maryland striped bass), bluefish, croakers, Spanish mackerel, and other species. We also offer Chesapeake Bay lighthouse cruises, sunset cruises and other Chesapeake Bay tours, floating crab feasts, and cruises to various destinations along the Chesapeake Bay. We are located on Hoopers Island, about 40 minutes south of Cambridge, Maryland. Regardless of the size of your group, or the uniqueness of your occasion, there is nothing that we can't handle! Come join us for a memorable Chesapeake Bay charter fishing experience from Maryland's Eastern Shore! Chesapeake Bay Fishing At Its Finest! During this time period, we fish the middle and lower portions of Maryland's Chesapeake Bay, which include as far south as Point Lookout and as far north as Tilghman Island. If we need to, we will move our boat to be closer to where the fish are. During the trophy Chesapeake Bay rockfish season, trolling with the use of planer boards is the primary method of fishing. We generally fish with 20 or more lines at a time in order to increase our chances of landing the big one! These Maryland rockfish can range anywhere from 28 inches in length on up to 50 inches or more. If you catch one of these trophy striped bass and you want to find out how old that fish is, please visit this link for more information. Per Maryland law in 2018, fishermen are allowed one fish per person that must be at least 35" in length. Over this stretch, we fish for a wide variety of species that include striped bass, bluefish, croakers, white perch, and spot. We also do our Chesapeake Bay fishing trips in about the same areas as we do during the spring trophy season. Our principal method of fishing for Chesapaeake Bay striped bass in the summer is a method known as live-lining. Live-lining involves the use of spinning reels and light tackle. When you live-line for rockfish, you put a live spot fish on a treble hook, and watch it swim away. If there are any stripers around, they may latch on to that spot and give you one heck of a fight! It's really exciting when we anchor on a pile of striped bass, and everyone in the group catches at the same time! For more information about live-lining for striped bass, check out my article on striped bass! We also may troll for striped bass during this time of year with the use of umbrella rigs. When the weather cools off on the Chesapeake Bay, the spot leave town. This requires us to resort to trolling for striped bass. When trolling during this time of year, we normally pull fewer lines to give us more mobility. We often see bait pods and clusters of birds gathering on the water surface, which often lead us to the fish! There have been many times where we go through a cluster of birds and have every rod go down at once! During this time frame, anglers are allowed two striped bass that must be at least 19 inches in length. Of these fish, only one per person can exceed 28 inches in length. In addition to the above types of Chesapeake Bay fishing, we also do a fair amount of bottom fishing for croakers, spot, and white perch. When we bottom fish, we use spinning reels, and a bottom rig that has two hooks and a 2-4 ounce sinker. Often, we will have our charter groups bottom fish for the spot that we use to live-line for striped bass. In fact, a lot of our groups have more fun doing that than they do when reeling in rockfish! We offer full and half-day Maryland fishing charters off of Maryland's Eastern Shore, fishing for Maryland rockfish (stripers or Chesapeake Bay striped bass), bluefish, croakers, Spanish mackerel, and other species. We also offer Chesapeake Bay lighthouse cruises, nature cruises and other Chesapeake Bay tours, floating crab feasts, and cruises to various destinations along the Chesapeake Bay. We are located on Hoopers Island, about 40 minutes south of Cambridge, Maryland. Regardless of the size of your group, or the uniqueness of your occasion, there is nothing that we can't handle! Come join us for a memorable Maryland charter fishing experience on the Chesapeake Bay! Take US-50 to Cambridge, MD (Eastern Shore). Turn onto MD-16 (near Wal-Mart) and proceed 7 miles to Church Creek. Turn left on Rt. 335 and travel approx. 10 miles to intersection of Rts. 335/336. Turn right (Rt. 335) and follow Rt. 335 to Hoopers Island (about 6 miles). 1 1/2 miles after crossing 1st tall bridge onto Island, turn right on Hoopers Island Rd. (before Dead End sign) and proceed 6 miles to Rippons Marina, going over another tall bridge. 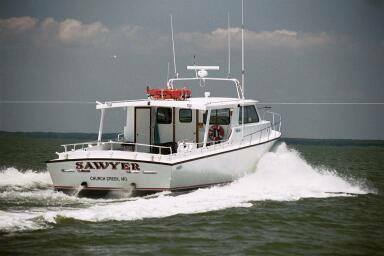 Sawyer Fishing Charters is a top Cambridge, MD charter fishing service on CharterBoat.guide!